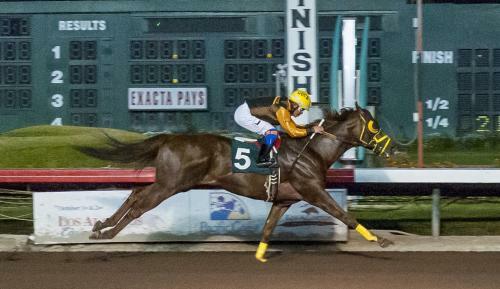 Robert Bean and Alan Mindell’s Candy Zip was superb in the Rossmoor Handicap, sailing past Run Raging Rhino Run and Bound To Bet on the way to a four length victory in the fastest 870-yard clocking of the meet of :44.453 on Saturday at Los Alamitos. Ridden by Ramon Guce, Candy Zip’s winning time easily bettered the previous best time of the meet of :45.03 season posted by Oil on February 23. Candy Zip’s victory also Bean his first stakes win as a trainer at Los Alamitos. For Bean, the victory by the 4-year-old New York bred horse was fun moment in a career that has included some special times. “I started out going to the Kentucky Derby with Jaklin Klugman in 1980,” said Bean, who hot walked the multiple stakes winner of $478,879 owned by actor Jack Klugman. Jaklin Klugman ran third to the filly Genuine Risk in the Kentucky Derby. Bean would later campaign racehorses in partnership with Klugman. The two bred the stakes winner Barbie Karen, who won the Lady Morvich Handicap at Bay Meadows and finished third in the Grade 3 Hillsborough Handicap in 1985. In his first start for Bean and Mindell, Candy Zip finished second to Oil at 870 yards on January 27. “We got a beat a whisker by Oil. (Candy Zip) ran well at Santa Anita so this race came up and here we are,” Bean added. Bred by Sugar Maple Farm, Candy Zip improved his record to three wins from 13 starts. He earned $8,250 for the win to take his career earnings to $76,373. As for Guce, this track’s all-time leading Thoroughbred rider has been in top form since returning to the saddle after missing over 18 months with following a riding accident that left with a lot of pain around his previously fractured C2 and C7 cervical vertebrae and his T1 vertebrae. Guce was sidelined until the pain subsided. In mid-January of this year, Guce, a winner of nearly 1,100 Thoroughbred races at Los Alamitos returned. Dan Wilson’s Run Raging Rhino Run finished second in the Rossmoor for jockey Minor Arana and trainer Felix Gonzalez. The son of FDD Dynasty has now finished in the top two in six consecutive starts. He entered this race after a runner-up effort to Oil in that aforementioned February 23 race. El Koreano ran third and was followed by St. Reno, Great Ma Neri and Bound To Bet.